Warner will soon issue a new remastered director's cut of Blade Runner in September now that it has cleared up rights issues, followed by a theatrical release of a version promised to be truly director Ridley Scott's final cut. Warner's rights to Blade Runner lapsed a year ago, but the studio has since negotiated a long-term license. When Scott ran overbudget, completion bond guarantors took control of it and famously fucked it up (Highlander II style). This was replaced by Scott's superior director's cut in '92, but he (much like God with the Star Wars Trilogy) was unhappy with it as he was rushed and unable to give it his full attention. He began work on the newest version at the turn of the century, but it was shelved by Warner soon after, due to them being unable to secure rights from executive producer Jerry Perenchio. In a very un-Hollywood fashion, Warner have revealed it's plans for all forthcoming versions of the film on DVD so that people won't make the mistake of buying one, and then getting a better one in a years time: The restored "Director's Cut" will debut on home video in September and will remain on sale for only four months, after which time it will be placed on moratorium. 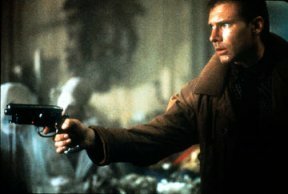 Blade Runner: Final Cut will arrive in 2007 for a limited 25th anniversary theatrical run, followed by a special-edition DVD with the three previous versions offered as alternate viewing. Besides the original theatrical version and director's cut, the expanded international theatrical cut will be included. The set will also contain additional bonus materials.